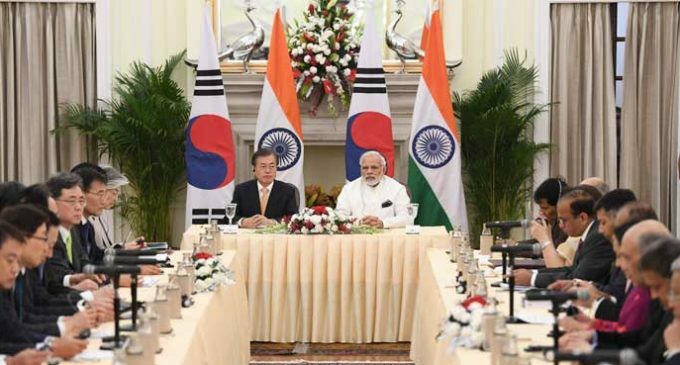 New Delhi, July 11 (IANS) In bid to further boost their economic and political ties, India and South Korea agreed to upgrade their Comprehensive Economic Partnership Agreement (CEPA) and strengthen the Special Strategic Partnership they share following delegation-level talks headed by Prime Minister Narendra Modi and South Korean President Moon Jae-in here on Tuesday. “We have taken an important step in the form of an Early Harvest Package to further upgrade our Comprehensive Economic Partnership Agreement,” Modi said in a joint address to the media along with Moon after the meeting. “Keeping in view the future of our relationship and the rapid technology changes across the world, we have decided to set up an Innovation Cooperation Centre and form a Future Strategy Group,” he said. 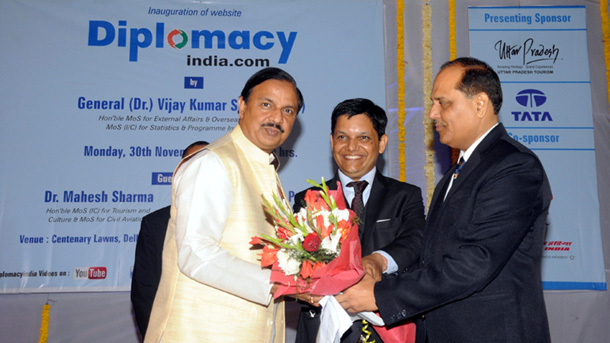 “Korean companies have become household names in India for their commitment to quality of their products,” he said. A joint declaration titled “A Vision for People, Prospersity, Peace and our Future” issued following Tuesday’s meeting said that noting the complementarities between India’s rapid economic growth and its highly-skilled workforce, and South Korea’s technological prowess, manufacturing excellence and developmental experience, both sides agreed to partner with each other to secure mutual economic growth and contribute to global economic development. “In this context, India welcomed ROK’s (Republic of Korea’s or South Korea’s) willingness to partner in India’s flagship initiatives, including Make in India, Skill India, Digital India, Start-up India and Smart Cities,” the declaration said. It stated that the business community of both countries has been urged “to leverage opportunities arising from complementarities between the two economies, to enhance investment, to promote joint ventures, and to work towards the goal of raising bilateral trade to $50 billion by 2030”. Following Tuesday’s talks, the two sides also decided to further strengthen their Special Strategic Partnership. The India-South Korea relationship was elevated to that of a Special Strategic Partnership during Modi’s visit to that country in 2015. The Prime Minister also said that India’s Act East Policy that seeks to strengthen ties with Southeast Asia has natural commonalities with President Moon’s New Southern Policy. In his address to the media, Moon said that he is pressing ahead with the New Southern Policy that seeks to make India South Korea’s key partner for cooperation. “By facilitating exchange between the people of our two countries, we have decided to broaden the scope of our mutual understanding,” the South Korean President said. The joint declaration, in which South Korea is described as an “indispensable partner” for India‘s Act East Policy and India as a “central pillar” of Moon’s New Southern Policy, stated that both sides will work towards fostering a “future oriented partnership for people, prosperity and peace”. Briefing the media here, Preeti Saran, Secretary (East) in the External Affairs Ministry, said that while Moon briefed Modi about recent developments on the Korean Peninsula, the Prime Minister briefed the visiting President about India’s vision for the Indo-Pacific region. “Recognising the link between prosperity and security, we reaffirmed the importance of freedom of navigation, overflight and unimpeded lawful commerce,” the joint declaration stated. Lauding President Moon for his role in the Korean peace process, Modi said that India is one of the stakeholders of the success of this as proliferation links between South Asia – a veiled reference to Pakistan – and Northeast Asia is a cause of concern for New Delhi. “They are in discussion stage but there is seriousness on both sides to ensure that we do this, not just in Afghanistan but with other partners as well,” Saran explained. As part of Moon’s visit to India, his first since becoming President in May last year, India and South Korea signed 11 agreements, including in the areas of trade, cultural and scientific and technological cooperation.